Using machine learning to analyze image data from drones and how this could prove to be useful in natural disasters. I’ve written a few times recently about a number of projects that are using drone technology to monitor vast environments. As you can perhaps imagine, with such endeavors, there is a huge amount of data generated, and while it presents rich pickings from a scientific perspective, nonetheless raises challenges about how that data can be managed. A recent study tested the role automation could play in both easing the burden on research teams and making data analysis more effective. The paper revealed that when teams are looking for optimal speed and accuracy that an approach that combines both machine and human can be the best. 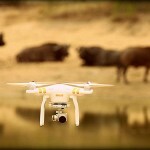 The researchers used the analysis of aerial images taken by camera drones in the Kuzikus wildlife reserve as their testing ground. The drones were used to count the wildlife in the park, and generated a huge amount of images over the course of the study. Sifting through this database manually would take far too long, whilst computers still struggle to accurately distinguish between objects in such photos, so the team used a hybrid approach. They recruited volunteers from the Micro Mappers crowdsourcing platform to analyze most of the photos taken by the drone. “Within two days, they had evaluated 98% of the 26,000 images that had been uploaded,” the team reveal. This was then used as material by which the algorithm was trained to identify the images on its own, with the honed algorithm then put to the test on the remaining 2% of images. “The 500 digital volunteers did generate a number false positives, tracing features that in actual fact were not animals. Despite that, their analysis was certainly good enough to serve as training data for the computer algorithm,” the authors say. The team believe that this approach could have a wide range of applications, including in disaster response. The system was put through its paces in an initial trial with the World Bank to help them speed up the assessment of damage in the aftermath of tropical cyclone Pam, which struck the island of Vanuatu in 2015. It will be interesting to see what other applications emerge using this approach.